*These are all products I have purchased myself. No one is sponsoring me to talk about any of the above products. I have learned over the course of a few years that a great skin care routine is essential. Makeup does not cover everything up, and I don’t always want to wear heavy foundation, especially in the summer time. That means I have to try to take care of my skin year around. I do not have great skin. My skin is super dry all year, and I have a natural red tone all over. It’s so wonderful. By wonderful I mean frustrating. However, I have finally found a skin care routine that works for me. I have started to see drastic changes in my skin, and much of the redness is even starting to go away. This is my own personal routine. I feel that anyone should have one. I will say that switching over to all natural products has probably been what has been changing my face for the best. As you can probably see in the picture, I am a huge Burt’s Bees fan. I snagged a few of their products last year on sale and I have been hooked ever since. Their makeup wipes smell clean and fresh and are not harsh on my face at all. They remove most of my makeup with no problems. The face wash I use is Burt’s Bees Intense Hydration Face Wash. This stuff really does hydrate my face. I’m addicted. I have the type of skin that can be moisturized 100 times a day and still have dry spots, but when I use this wash I don’t have to worry about it. Witch Hazel has become one of my best friends. 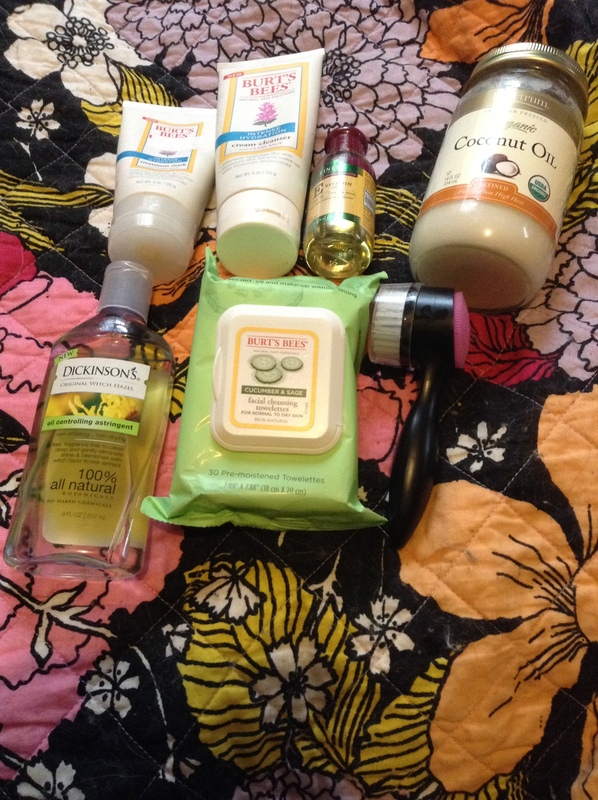 I’m pregnant, so I try to avoid face products with weird acids and such. Witch Hazel is cheaper and WAY better than any weird acid toner on the market, in my opinion. The smell is kind of funny, but the results are amazing. After I use Witch Hazel I dab Vitamin E oil on any dark marks on my face from previous breakouts. Vitamin E can be found in a liquid pill form, or just a liquid like the one I have (found at Walgreens for $8). It lasts forever. It’s a great product to have for any scars on your face or body. My mom was actually the one that introduced this to me when I was a kid. I had chicken pox, and of course like any kid I scratched my face when I wasn’t supposed to. She put Vitamin E oil on my face and now I have no scars whatsoever. Once a week I use Burt’s Bees Intense Hyrdation Face Mask. All you do is rub the product on your face and wait for 10 minutes (I let it sit for 20). Afterwards, you just wipe it gently with a cloth and rub the rest into your skin. It’s wonderful. My face feels so soft and smooth every time I use this mask, and I’ve been using it for a year now. The brush in the above picture is actually a new addition to my skin care routine. I need exfoliation, but most exfoliators are too harsh on my face and make me look like a lobster afterwards. I got this brush at Sephora for about $16. It’s called the dual action face brush. It has a bristled side and a pink padded side that works as an exfoliating brush. I alternate sides on this brush when I am washing my face at night. This has been a saving grace for my face the past few weeks. My pores look smaller, and my skin feels smooth and clean at all times. I would highly suggest this brush for anyone with sensitive skin like myself. Anyone that knows me knows that I am obsessed with coconut oil. I use it for everything. I use it to cook. I use it as a diaper rash cream. I use it to clean at times. The possibilities are endless. This amazing oil is also my face moisturizer. It is the best moisturizer I have ever used. It’s not thick or weird feeling on my face. It goes on smooth and keeps my face soft all day. On days where I want to wear foundation I can wear it without worrying about dry patches thanks to coconut oil. I would say that anyone and everyone needs coconut oil in their pantry. It has so many uses. That is my skin care routine at the moment. My skin has been responding so well to it that I will be sticking with this routine until further notice.